Dave, an Ordained Cowboy Chaplain, holds an earned Doctorate from Christian Life School of Theology, Columbus, Ga., and a Bachelors of Theology from International Seminary, Plymouth, FL. He has also completed Level One Clinical Pastoral Education at Wake Forest University Department of Chaplaincy and Pastoral Education. Dave is an ordained Senior Chaplain and lifetime member of the International Fellowship of Chaplains having completed the required courses through IFOC and the University of Michigan. Dave has preached the Gospel all across the nation; at churches, rodeos, horse shows, state fairs, horse sales and anywhere and everywhere that Cowboys and Cowgirls gather. Please contact headquarters and set up a Cowboys For Christ Day at your Church, school, Cowboy event or livestock function, and let us help you share JESUS CHRIST in your area. As a horseman, Dave has more than thirty years in the horse business, with over one half of those years as a professional trainer, and he has trained and shown horses to championships in three different breeds: Quarter Horse, Paint Horse, and Arabian. He has trained, shown, and won riding all three disciplines: western, hunt seat, and saddle seat. He is a certified farrier, specializing in balanced and corrective shoeing. He has developed Horse Sense Horsemanship and presents it at many events and to many organizations. Cowboys For Christ is a nation-wide ministry that has a proven track record of taking the Gospel of JESUS CHRIST to the entire livestock industry and beyond. Cowboys For Christ has been in action for over four decades, and during this time our unblemished reputation has been maintained by the leadership, the Cowboy and Cowgirl Chaplains, and an army of volunteers. Our worldwide recognition has opened many doors to minister in places that were completely closed to other types of ministries. Literally hundreds of thousands of lives have been touched by the LORD through this ministry by the dedicated Cowboys and Cowgirls who have committed themselves to serve the LORD in the cowboy world and beyond. Cowboys For Christ is certainly not a “bench warmer” ministry, and we have ministered all across the nation and around the world establishing this point. We are the “Go To Them” hard riding Cowboys and Cowgirls that are not ashamed of the Gospel of JESUS CHRIST, and we sure want to share HIS LOVE and wonderful plan of eternal salvation to all that we meet as we ride through the trails of this life. We have over forty-four years of ministry, and the Christian Ranchman has gone out since 1976 to confirm the spiritual work in the Cowboys and Cowgirls that have been reached for the LORD. The multitude of lives that have been touched by the faithful, obedient, anointed and dedicated workers of Cowboys For Christ are known only by ALMIGHTY GOD. 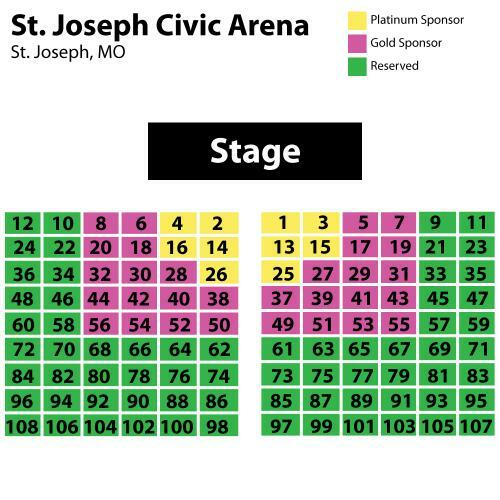 RESERVED TICKETS To purchase Platinum or Gold Sponsor tickets, please call 816-271-4717.